As I was venting with my prayer group one morning, there is almost a sadness to this devotion: the Lord Jesus, in essence, pleading with us to love him, begging us to love Him; and then letting us know, through the image of His Sacred Heart, how ardently, how passionately, how intensely He loves us. What a Savior! To melt our coldness, to counteract our indifference, He pleads with us to look at His Sacred Heart – all aglow with a burning love for humanity – and to fall in love with He who should be everything to us. I remember once, when I had a Mustang GT convertible, I used to stare at it in the garage: I was in love with that car. Oh, if only I could transfer my love of material things to the Lord Jesus: to Him who is infinitely good and should be the very “sunshine of my life.” If I really knew how to value what is true and lasting, how much more would I love Him? “Jesus belongs to us….He loves us with a love no words can tell. He condescends … with a longing which is equally indescribable, that we should love Him with a fervent and entire love. He has kept nothing back from us. There is no faculty of His human soul which has not had to do with our salvation. There is not one limb of His Sacred body that has not suffered for us. There is not one drop of His most Precious Blood that He has not shed for us, nor is there one beating of His Sacred Heart that is not an act of love toward us” (slightly adapted from All for Jesus). Jesus apparently instituted this devotion to get us to love Him! He wanted to remind us via the image of His Sacred Heart that He loves us with an unsurpassable love. He is through this devotion showing us His love for us, so as to woo us to love Him. What a Savior! Is it not a little sad, a touch lamentable, that He has to go to such lengths to get us to love Him. For some reason, for some choice made by the Eternal Trinity, no doubt in view of the Incarnation and Jesus being loved by the Virgin, He has chosen to need our love. Imagine that: God needs our love! Amazing, but true. And, of course, the true goal of the Sacred Heart devotion is Eucharistic love, for that is where the Sacred Heart truly beats moment by moment with love for us! One cannot exaggerate the immensity of graces available in the Eucharist. If this great Lord is wooing us to love Him in the Eucharist, shall we refuse the invitation? What if each one of us was to offer to Jesus one hour of adoration every two weeks? Oh how on the day we give the account will we be grateful for having done so. We will know Jesus. He will recognize us! Devotion to the Sacred Heart came first to Saint Gertrude the Great. The Lord revealed to her, as Faber relates, “that as often as a man gazes with desire and devotion on the Host, where the body of Christ lies hidden sacramentally, so often does he increase his merit in Heaven.” The time is short. Don’t delay. He’s waiting. Praise the Sacred Heart of Jesus Christ! 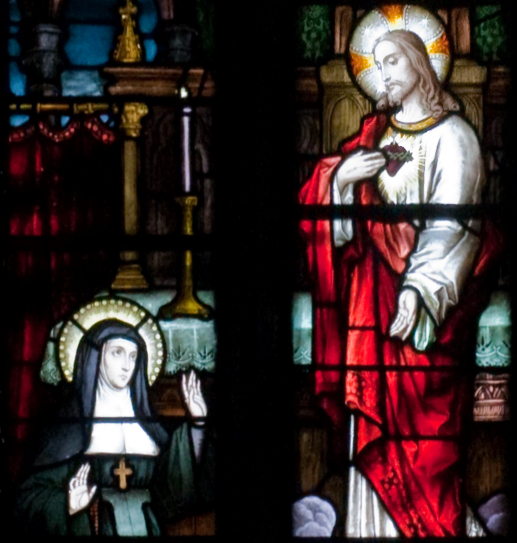 Image Attribution: Per Wikipedia, “Detail of a stained glass window in the east wall of the south transept, depicting Saint Margaret Mary Alacoque and how she received a revelation of the Sacred Heart” (located in The Cathedral Church of the Assumption of the Blessed Virgin Mary, Tuam, Ireland). Designed and manufactured by Joshua Clarke (1858–1921) and the Harry Clarke Studios (1889–1931). Self-photographed on 9/14/ 2009 by Andreas F. Borchert; this file is used and licensed under the Creative Commons Attribution-Share Alike 3.0 Germany license. Note: An excellent book on how to practice the Sacred Heart devotion is The Devotion to the Sacred Heart of Jesus by Father John Croiset (TAN). Highly recommended.